People fear what they do not understand. But what if you feared yourself? Jesus, or Yeshua Bar Joseph as he is known to his family, is just past thirty years of age. He is well aware that there are those around him who still whisper about his birth: the Magi, the gifts, the Angel coming to prophecy his coming. But he wants nothing more than to live a normal life amongst his family. He longs to be a normal man but those around him watch. They wait. The winter has been cruel, dry and no rain has graced the land around them. And so they hope that Jesus will bring great change. It is only a matter of time. While those around him wait for his greatness to reveal itself, Jesus struggles with his lot in life. In love with a kinswoman, Avigail, Jesus knows that he cannot marry her. He does not know everything that is planned for him, but he knows she is not for him. Torn inside, Jesus wonders what his lot in life truly is. He wonders how long he will have to wait before his true purpose is made clear to him. When brigands attack Nazareth, Avigail is harmed, shamed. To save her virtue, Jesus prays to God to bring rain. And he does. When the townspeople come to Jesus to ask him to stop the rain, He again asks God for help; and the rain stops. The whispering around Jesus reaches a fever pitch when news reaches them: Jesus’ cousin, John, has emerged from the woods speaking of a prophet, a Messiah. John knows that this Messiah is Jesus. 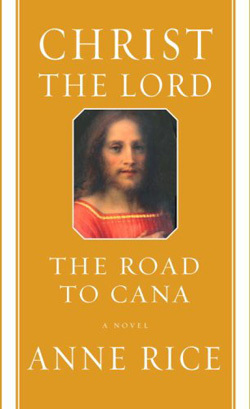 Having read Christ the Lord: Out of Egypt, I was more than eager to get my hands on Anne Rice’s new novel Christ the Lord: The Road to Cana. It continues the story of the life of Christ as he heads towards his destiny. Frankly, I was a little worried. I was worried that the second book wouldn’t be as good as the first one. I loved Christ the Lord: Out of Egypt so much. I’ve read it countless times and it’s become one of my all time favourite books. Would The Road to Cana be as breath taking, as incredible, as beautiful? I needn’t have worried. Christ the Lord: The Road to Cana is just as meticulously researched as Out of Egypt was and just as beautiful if not more so. In Out of Egypt we saw Christ as a boy. Now we come to know him far more intimately as he struggles with the man he has to become. What I love most about this book is that, though Jesus is divine, Rice has done an amazing job of portraying him as human. She has really given us the ultimate study in human nature as Jesus struggles and then accepts what he is, what he must do. She shows us a man who knows what he must do and the sacrifices he makes to do it. Now, I’m not a Christian. I normally don’t read what I would call Christian fiction. Most Christian fiction actually makes me a little uncomfortable. But that doesn’t matter. Rice has written a novel that goes beyond the religious aspect of Christianity and embraces the spiritual. This is not a book about religion but a story of love, family, forgiveness and redemption. You don’t have to be a Christian to enjoy this book. I know that there are plenty of people out there who probably don’t want to give it a chance based solely off of its subject matter. I’ve had people scoff at me when I told them how incredible Rice’s Christ the Lord books are. I know that some of you, reading this review, are still scoffing. But they’re amazing books, people. And Christ the Lord: The Road to Cana is the best book that Rice has ever written. It transcends genres and religion and is seriously good storytelling and amazing historical fiction. Its prose is like poetry and I was moved beyond words as I read it. I know that I will be reading Christ the Lord: The Road to Cana again as I eagerly await the next instalment in the life of Jesus. I’ve been wondering about these new Anne Rice books. Thanks for the thorough review. I’ll be checking them out soon and taking them on my next trip, http://www.bentpage.wordpress.com.